According to a new market report published by Transparency Market Research titled “Out of Home Tea Market [Type (Black Tea, Green Tea, Herbal Tea, MatchaTea, Oolong Tea, and Others); Packaging Type (Loose Tea, Tea Bags, Bottled Tea, Canned Tea); End-use (Quick Service Restaurants, Restaurants, Bars & Pubs, Hotels, Café/Coffee Shop Chains, Work Places, Outdoor, and Others)] – Global Industry Analysis, Size, Share, Growth, Trends and Forecast, 2018 – 2026,” the global out of home tea market is expected to reach a value of US$ 42.23 Bn by 2026. The market is estimated to expand at a CAGR of 10.4% during the forecast period from 2018 to 2026. Consumption of out of home tea is significantly increasing across various end-use segments such as restaurants, bars & pubs, quick service restaurants, hotels, cafes, and workplaces. Increasing preference for tea mixed with fragrances, flavors, and herbal ingredients is one of the primary drivers for the growth of the out of home tea market. Moreover, increasing health hazards due to increased coffee consumption, coupled with rising popularity of tea as a healthy and convenient beverage is also anticipated to increase the demand for out of home tea. Furthermore, changing scenarios of retail stores through introduction of tea outlets by renowned retail chain players such as Starbucks Corporation, Costa Ltd. as well as introduction of customization in their products due to increasing consumer demand is anticipated to drive the growth of the out of home tea market. Black tea segment held a major share of approximately 33% in 2017 and is anticipated to expand at the fastest rate during the forecast period. Based on packaging type, tea bags segment is anticipated to expand at a good pace between 2018 and 2026 due to increasing consumer preference for tea bags. Asia Pacific region held the maximum market share of approximately 68% in 2017 in terms of revenue generation and consumption volume, closely followed by Middle East & Africa. Asia Pacific is anticipated to dominate the market during the forecast period due to the dominance of China and India, both in terms of production and consumption. Based on tea type, the out of home tea market is segmented into green tea, black tea, matcha tea, herbal tea, oolong tea, and others. Green tea segment is anticipated to grow at a faster rate during the forecast period. 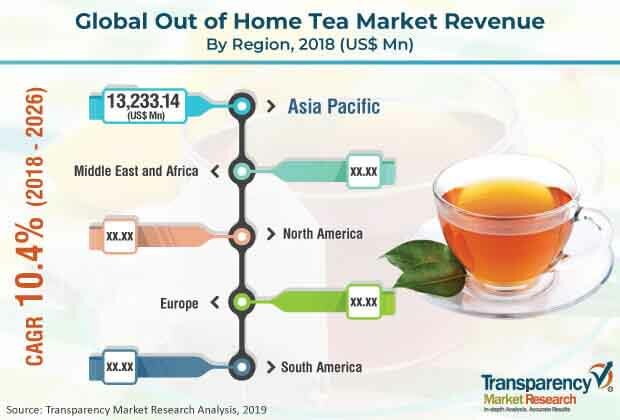 By end-use segment, the global out of home tea market is categorized into restaurants, bars & pubs, quick service restaurants, workplaces, hotels, and others. In terms of end-use, the hotel segment acquired greater market in 2017 due to increasing trend of brewing sophistication in the high end tea market. Loose tea, bottled tea, tea bags, and canned tea are the packaging tea types in the out of home tea market. Loose tea held the largest market share in 2017. However, tea bags segment is expected to grow at a rapid rate during the forecast period. Changing consumer preference due to increasing disposable income and changing lifestyle has forced manufacturers to come up with new and innovative products. Some of the key players operating in the global out of home teamarket include Tata Global Beverages Ltd., Costa Ltd., Celestial Seasonings, Inc., Nestle S.A., The Republic of Tea, Tenfu Corporation, Bettys and Taylors Group Limited, Kusmi Tea, Peet’s Coffee & Tea, Unilever Group, Starbucks Corporation, The Coca-Cola Company, PepsiCo, Inc., Associated British Foods, and Dilmah Ceylon Tea Company Plc.